Located on the North Shore, opposite to its NTBG counterpart at Allerton and McBryde on the South Shore of Kauai, The Limahuli Garden and Preserve is a unique step into the History of Botanical Hawaii. 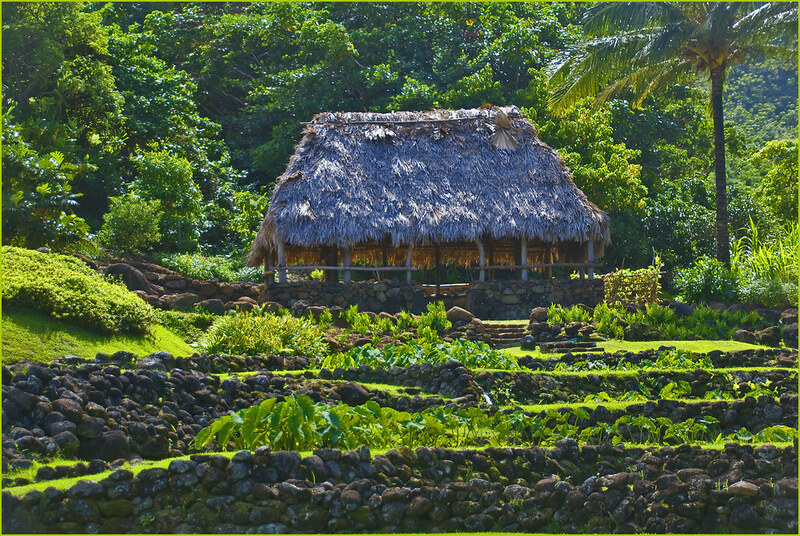 Including so much more cultural information then just its extensive plant collection, this garden shows its visitors how ancient Polynesian Settlers visualized and developed their agriculturally based, resource conservation minded way of life. Including a chronological progress throughout the garden, Limahuli Garden and Preserve showcases the introduction of Polynesian plants, unique terraced agriculture, water diversion practices, living sites, and pristine native forest. From Mauka to Makai, is a saying in Hawaii that refers directly to the land division system that Ancient Hawaiians created and still recognize today. Ancient land divisions were highly complex, but nothing like the “private property” values we have today. Instead, land even though it was divided, was held in common, and boundaries were created by natural lines. Ahupuaa are defined by the watershed boundaries between run-off escapements within each larger, wedge-shaped Moku land division. An Island was called a Mokupuni. For example, the Limahuli Garden and Preserve now covers a creek valley in the Haena ahupuaa, within the Halelea Moku on the Mokupuni (island) Kauai. Origins of the Limahuli stream, high up in the mountain forests serve as the starting point for the preserve, running completely down into the ocean. For reference, the Haena Ahupuaa is one of the last, functioning ahupuaa in all of Hawaii. Limahuli Garden and Preserve uses ancient land management techniques as a template to develop and maintain their plant collections, and the well preserved ancient archeological sites that reflect the amazing ingenuity, principals and culture of the original Kauai island settlers. Limahuli Garden and Preserve offers service-learning volunteer opportunities on most every Wednesday, often centered around native plant restoration, with awesome and friendly facilitators that work in the gardens on a regular basis. Learn deeply by working with facilitators who understand the history, connection, spirituality, legends and experiences that shaped the breathtaking valley. Call 808-826-1053 or e-mail volunteerlimahuli@ntbg.org to learn more in depth about current projects. Tours of all different kinds are also available, from self-guided exploration to tours facilitated by garden experts and stewards. ← The Ocean Needs Your Help – Volunteer with Surfrider this Month!